There’s a common misconception that runners are hard to shop for. After all, running doesn’t need a lot of gear, right? 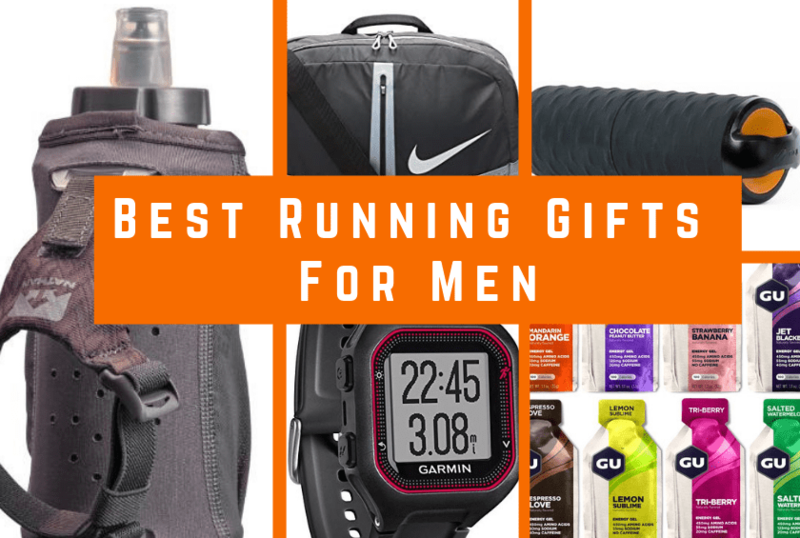 Actually, there are plenty of gift options for the runner in your life. Even better, many of these items help prevent accidents and injuries. You’re not just giving a gift–you’re helping someone enjoy their passion. Even though most of the focus is on the feet, running is a full-body exercise. You can find gear to help prevent injuries, increase visibility, stay hydrated and much more. 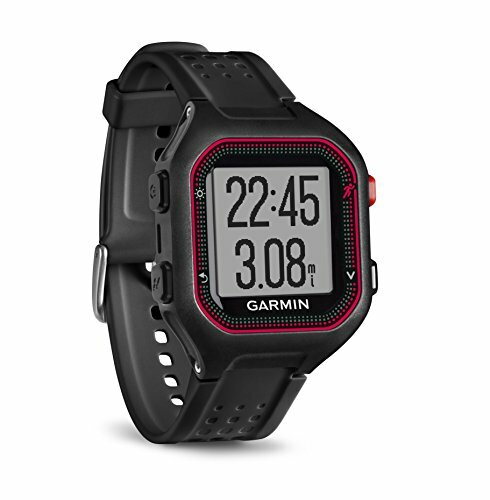 Track your running stats with this durable, multi-faceted watch. It can count your steps, calories, travel distance and more. There’s even an inactivity indicator that alerts you if you’ve been sedentary for too long. GPS technology provides accurate tracking anywhere in the world. Satellites track your distance, speed, and location with unparalleled precision. The GPS signal can track through trees and a variety of other types of cover (although it does have some difficulty with concrete). You can stay connected with other runners by sharing your activity and progress on social media. The watch pairs to a variety of smart devices, and connects to popular fitness apps such as Garmin Connect and Strava. A rechargeable battery provides 10 hours of life in training mode. When in activity tracking mode, the watch can go 10 weeks until needing a recharge. While the Forerunner 25 is among the most popular models, Garmin makes a wide variety of running watches with a wide range of features. This particular unit is lightweight, thin and durable, a nice balance of features, performance, and price. Energize while on the run! Packed with vitamins and nutrients, these little packets of gel are designed to give runners a quick but long-lasting energy boost. They reduce muscle fatigue while increasing mental alertness. Each packet contains 100 calories, 450 milligrams of amino acids, and about 20 grams of carbs (exact amount varies by flavor). The recommended use is to take one gel before starting a run, and then another gel about every 45 minutes thereafter. They’re great for both short and long-distance runners. A variety pack includes six flavors: Chocolate Outrage, Salted Caramel, Vanilla Bean, Jet Blackberry, Tri-Berry, and Strawberry Banana. Some of these flavors contain caffeine, but not all do. And while energy gels aren’t exactly the height of gourmet experiences, most runners enjoy the taste. 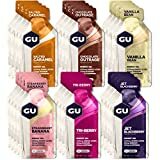 There are quite a few energy gels available, but GU is considered one of the best and most popular. Since being introduced in 1993, the formula has been updated to meet the nutritional needs of pro runners, while remaining a popular and essential item for runners of all skill levels. The right underwear helps runners stay comfortable and chafe-free. Combining comfort and support, these Swing Shift boxer briefs are designed for high-endurance athletes. They’re made from a blend of modal and cotton, which makes them both breathable and silky. Tag-less and with a unique Joey Pouch, your legs and personal area stay protected from unwanted skin contact. Plus, a No-Drip-Tip layer keeps you dry by wicking away sweat and moisture. While nobody wants ill-fitting boxers, fit takes on special importance for runners. These boxers are designed to move. 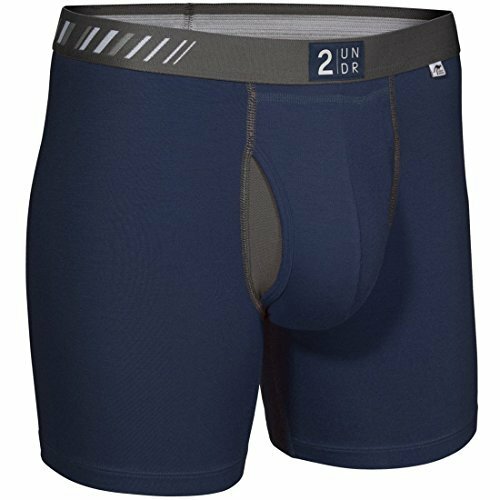 The premium 3.5 cm roll-resistant waistband keeps the boxers snug and secure even during long periods of activity. Plus, flat-locked stitching and construction seams won’t rub against your skin. 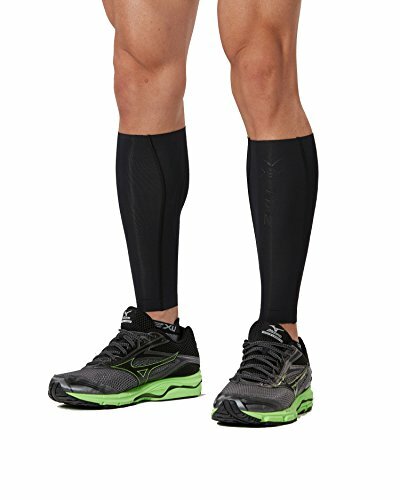 Compression is a hot topic with runners these days. These calf sleeves support your calf muscles to help reduce cramping, fatigue and the likelihood of shin splints. Wear them while running, or during recovery times. These sleeves from 2XU use 250 Denier Medical circular 360-degree knit construction to create consistent pressure around the entire calf. Regular use helps improve circulation and reduce symptoms of running-related injuries and soreness. The sleeves are made from 80% Nylon and 20% Lycra. They’re soft against the skin, with excellent moisture wicking. Whether worn while resting or running, they’ll remain dry and uncomfortable. The sleeves are both antibacterial and provide SPF 50 protection. You don’t have to wear warmup pants or other clothing over them because they’ll protect your legs from sunburn and debris. Although the manufacturer recommends hand washing, many people say they simply throw them in the washing machine. However, you are risking tears or other damage, so machine wash at your own risk. While staying hydrated when running is necessary, carrying a water bottle with you can often be a hassle. The ExoDraw Handheld from Nathan holds 18 ounces of water and is designed to remain comfortable and unobtrusive as you run. A soft, ergonomic hand strap keeps the flask secure in your hand, but doesn’t require a tight grip. Plus, the flask’s ExoSpine helps it keep a rigid shape for easy carrying even as the fluid level decreases. The neoprene sleeve is comfy to hold and pulls sweat away from your hands while the insulated sleeve helps keep liquids cool even during long runs in hot temperatures. It also includes a stash pocket for car keys, gels, or other small items. The hand strap is removable. You can then stick the flask into the side pocket of most backpacks or vests. A plastic cap and stopper keep the liquids in the flask when closed but allow for fast, full water flow when you’re thirsty. Designed for runners, these sunglasses from Tifosi will stay on your face in most conditions. A nose piece made from hydrophilic rubber conforms to your features for a secure and comfortable fit. Sweat from your face actually improves the grip! Instead of causing the glasses to slide off your face, the rubber nose piece uses any moisture to form a seal with your skin. They’re designed for physical exertion and all-weather use. The frames are made from Grilamid TR-90 nylon, which is both lightweight and durable. They stay comfortable even when worn for long runs. The lenses protect your eyes from UV rays, debris, and other hazards. Aside from running, they’re also great for cycling and other outdoor activities. Of course, you’re not going to need to wear sunglasses every time you run. So these glasses include a zippered shell case for easy storage. Non-runners are often surprised by how much gear running can involve. Aside from the shoes, runners need clothes, water bottle and many other accessory items on our list. 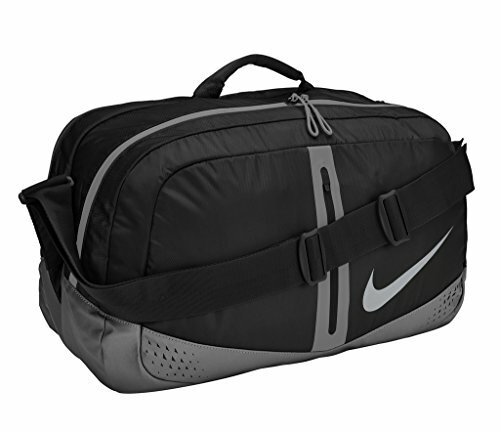 This duffel from Nike is a durable, easy way for runners to keep all their gear organized and ready to haul around. The bag features a variety of separate zipped compartments and an internal divider. Everything stays easy to find – and your sunglasses don’t have to mingle with your gym shorts! Also, certain storage compartments vent to keep those funky post-run smells from lingering inside. Weighing a lightweight 7.2 ounces, the bag holds a lot of gear without adding a lot of extra weight. Adjustable straps allow for both shoulder and cross-body carry. A padded base keeps your items safe–you can toss the bag in your car trunk without worry. Running at night has a lot of benefits, including less-populated streets and cooler temps. But proper light is necessary to prevent falls and car accidents. Most runners find carrying a flashlight too awkward, which is why night runners use a headlamp. 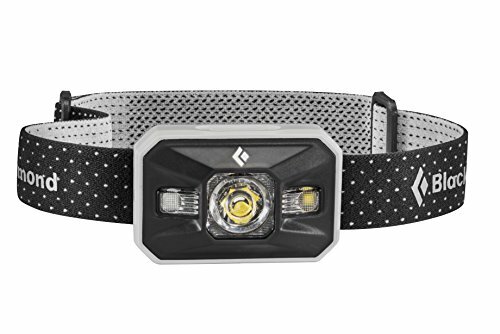 The Storm headlamp from Black Diamond is perfect for running at night. A wide variety of settings are available including proximity, distance, dim, strobe and RGB night-vision. This is a high-powered headlamp; the white LED light emits a whopping 350 lumens, providing bright light for every situation from city streets to the deep woods. The light’s Power Tap Technology lets you switch between full and dimmed power. This adjustability means drivers can always see you, but you don’t run the risk of blinding them. The red, green and blue settings can switch between dim and strobe without having to cycle through the white mode (again avoiding accidental driver blinding). Four AAA batteries provide about 120 hours of light. Dust- and waterproof, it can be worn in most weather conditions. What’s better than a foam roller to help repair and relax tired leg muscles? A foam roller with built-in heat. 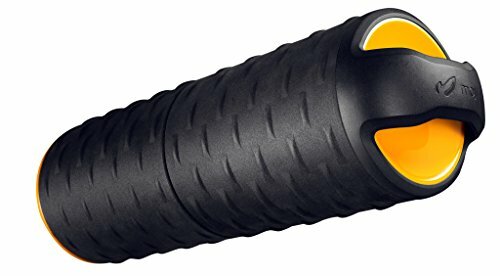 The MojiHeat roller has a soft and firm textured exterior. You can roll it most anywhere – calves, glutes, back and more. Regular use helps muscles stay loose and injury-free. While it’s great as a roller, the real star of the show here is the ability to add heat. Pop the roller in the microwave for 15 seconds or so to create long-lasting warmth. Now when you use the roller, your muscles have the added benefit of therapeutic heat. This combination of heat and motion targets deep tissues in a whole new way that is great for training, recovery and treating general aches and pains. After being “nuked” in the microwave, the roller stays warm for about 30 minutes. Plus, the roller is easy to transport. Simply toss it in your gear bag. It’s made from two separate components that can be unscrewed for easy portability. Runners know that to stay safe, they need to stay visible, and that means being easy to see from head to toe. These reflective laces help drivers see your moving feet. They’ll increase visibility, day and night. The no-tie laces allow you to slip your shoes on and off easily. They’re a great choice not just for runners, but for anyone who might have difficulty tying laces, such as kids or the elderly. But don’t let the no-tie fool you. These laces will help your shoes fit better than ever. 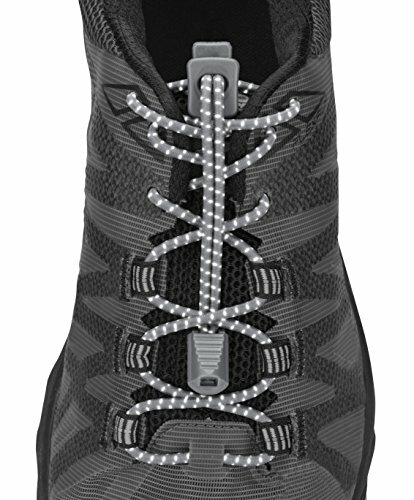 A push-button fastening system allows you to easily adjust the elastic laces to keep them tightly secure. The laces help prevent injury, too. There are no large lace loops or other tripping hazards. Instead, the laces always stay snug against the shoe.